Beautiful 007 bent grass greens await you at the Arnold Palmer designed Whistler Golf Club. The par 72, 6,722 yard course makes the most of its scenic and pristine setting. Broad fairways, interlaced with gentle streams and lakes, are bordered by majestic old-growth cedars and firs. 2019 Early Booking Deals are now available. Book before April 30, 2019 for the best rates. The course offers five sets of tees for all levels of golfers, including the gold "shorty" tees for juniors and beginners alike. The full service practice facility was completely renovated in 2010 and offers 5 target greens, a practice putting green, chipping green and practice bunker. Improve your game and enroll in a lesson or clinic with a CPGA Teaching Professional. We are not your typical golf shop. 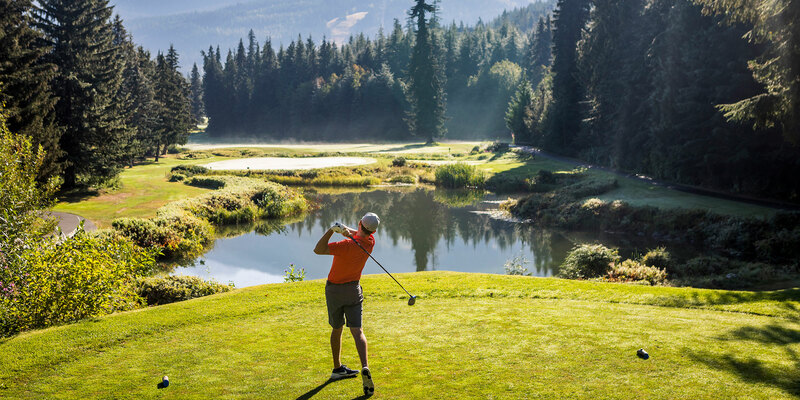 Ranked as “One of North America’s 100 Best Golf Shops” by Golf World Business Magazine, the Whistler Golf Club’s 2000 square foot Golf Shop is fully-equipped with the latest golf equipment and apparel. But there is more! Our shop has great lifestyle lines like Lole for women and Quiksilver for men. Our shop is quickly become known as one of the best clothing shops in Whistler. The Whistler Golf Club clubhouse is home to Palmer’s Gallery Bar & Grill. The restaurant boasts a spectacular 100-seat patio overlooking the 18th green and Whistler’s surrounding peaks, and features an outdoor bar and barbecue that is fast becoming one of Whistler’s favourite après spots. Palmer's Gallery is perfect for weddings, banquets or get-togethers for groups of 50 to 200 looking for a great location combined with outstanding cuisine and service. Known in Whistler as "The Range", our practice facility is the place in Whistler to work on all aspects of your game. EVERYONE WELCOME! Warming up for your round, taking a lesson or simply stopping by to rent a club and hit a few balls, The Range has everything you need. The Range is home to the Whistler Golf Academy which offers a complete series of lesson programs including private and couples lessons, mixed and ladies group clinics, junior golf schools and more. Every round includes complimentary cart usage. Shorter and longer duration packages are available. This offer is valid for up to 12 players. If you have a group of 12+ players, please call 1.844.955.3263 today to speak with a Whistler based Golf Specialist or Request a Quote. *Package price based on 4 adults sharing a 2 bedroom Deluxe unit/suite. 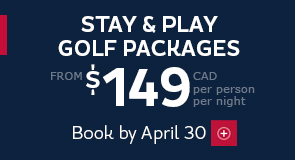 Price is based on 18 hole morning/day midweek tee times during midweek. US $ rates based on a 1.33 exchange rate. Rates may change with fluctuations in currency.